Felicia Barahona, 36, was found dead with her 4-year-old son Monday morning. HAMILTON HEIGHTS — A former student who fathered a boy with his science teacher four years ago has admitted killing her and their son in her Uptown apartment, sources told DNAinfo New York. 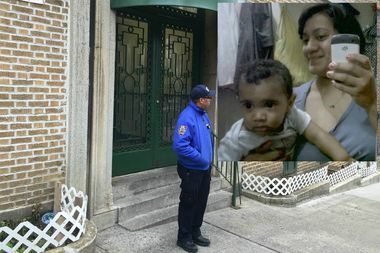 The suspect, Isaac Duran, 23, confessed to strangling Felicia Barahona, his former DeWitt Clinton High School teacher, with an electrical cord and fatally choking their 4-year-old son, Miguel, in the bathtub, sources said. The bodies were found early Monday when the superintendent was alerted to a smell coming from Barahona's apartment in her West 153rd St. building near Riverside Drive. Officials believe they had been dead several days. Barahona was discovered in the living room with an intact electrical cord wrapped around her neck. The cord was not attached to anything, there was no suicide note and no signs of forced entry at the scene, according to sources. Barahona's cause of death was ligature strangulation and its been deemed a homicide, according to a spokeswoman for the Office of the Chief Medical Examiner. Miguel was asphyxiated to death, killed by neck compression, the spokeswoman added. Duran, who was picked up Monday, confessed during questioning that he killed her and the child because he said he was upset at the way his son was being dressed and raised, sources said. He was arrested on murder charges Tuesday, police said. Their ill-fated relationship began in 2011 when he was still a student at DeWitt Clinton High School. Barahona, an Afghanistan war vet, was his science teacher. After becoming friends on Facebook, Barahona took the student trick-or-treating on Halloween along with her daughter. They ate at McDonald's and visited the Disney store in Times Square during the outing, according to a 2012 report from the Special Commissioner of Investigation. The report says that Barahona later invited Duran to her home on his birthday, where they had the first of what would be several sexual encounters. The teacher told the teenager not to worry about condoms and that she didn’t like using them, according to investigators. When Barahona became pregnant, Duran accompanied her to a doctor's appointment, and he even moved in with her for a few weeks in January of 2012 before the pair split up later that month, according to the report. Barahona admitted the relationship to city investigators, telling them she was in love with Duran and had planned to marry him, according to the report. She was fired from her $73,000 teaching job in August of 2012, a Department of Education spokesman said. The couple split before Miguel's birth. Building resident Nelson Jaque said he lived a floor below the woman and often saw her playing with her young son. "I would see her often, being very protective and almost obsessed with the boy," Jaque said. "As a matter of fact, I saw her early last week and I saw her calling for him. I told her to let him run, to let him have fun and she replied back, 'No!'" Jaque said he told his wife about three days ago that he smelled something strange, but didn't think much about it until Monday when he was walking his dog and the smell was stronger. "I'm just distraught for the child," Jaque said.